Think of an industry in which three big companies have used technology and economies of scale to become oligopolies and wield power over other enterprises. It hails not from Silicon Valley but the US east coast. The industry in question is passive investment management, in which computers take the role of human stock pickers and money is channelled into index and exchange traded funds. The Big Three of the US industry — BlackRock, Vanguard and State Street — have gained such size and efficiency that they control 80 per cent of the money invested in US index funds. Even Jack Bogle, founder of Vanguard and pioneer of the modern US index fund industry, is alarmed by their success. He has warned that, “if historical trends continue, a handful of giant institutional investors will one day hold voting control of virtually every large US corporation”. That is a scary prospect for the future relationship between companies and their investors. Chief executives such as Paul Polman, the departing head of Unilever, sigh at the short-termism of some shareholders and activists. Would life be better if they reported to huge robots? It might become quieter. Investors have traditionally expressed their displeasure with companies by selling shares, or by kicking up a fuss through public or private criticisms. The first tactic is barred to index funds: they have to hang on to stock in any company in an index, no matter how badly it is run. The weighting is set by a formula, not by individual discretion. Passive investors also have less incentive than activists to speak up and persuade a company to change strategy, since no single investment has much effect on their performance. Leo Strine, supreme court chief justice in Delaware, the state in which many US companies are incorporated, has described index funds as “the least active in exercising voice and judgment”. Companies should really want index fund companies not to remain silent, but to speak up. The worst of all worlds would be a shareholder base dominated by passive investors who are also passive owners, where most noise is made by a few activists who demand quick fixes. Index funds are naturally the most long term in outlook because they have no other choice. The Big Three have realised they cannot keep quiet and hope that no one will notice them. Larry Fink, chief executive of BlackRock, has taken to publishing an annual letter to chief executives, which is a clue to where power lies. In this year’s missive, he promised: “We must be active, engaged agents on behalf of the clients invested with BlackRock.” That involves hiring more overseers — BlackRock intends to double its “investment stewardship” staff in the next three years — and arranging more conversations with chief executives. It voted at 15,000 investor meetings on 130,000 proposals last year, while Vanguard “engaged” with 720 portfolio companies representing $1.6tn of its assets under management. As with investing, the giants are nothing if not efficient. They have their own governance guidelines and they do a lot of talking behind the scenes, following Theodore Roosevelt’s motto, “Speak softly and carry a big stick”. As one Dutch study suggested, they “exert structural power . . . in a way that is hidden from public view”. This gets results. A study of US companies held by passive mutual funds found that they performed better than their peers thanks to stricter governance, such as having more independent directors and fewer takeover defences. The fund groups are good at curbing misbehaviour. But their size and strength lead to two problems. First, they operate at such a scale that they tend to take a common approach to all companies. This is effective in imposing minimum standards in matters such as executive pay, but it does not amount to engaging deeply with corporate strategy in the same way as activist investors. Companies could be left ticking boxes for passive investors, while still being exposed to intense, targeted pressure from activists who have more time. Mr Fink insists that talking consistently to long-term shareholders such as BlackRock will help companies not to be picked on by those with “the shortest and narrowest of objectives”, but the jury is still out on that. Second, so few investors holding so much power would be worrying even if they were paragons. I sympathise with Vanguard’s decision to shine its spotlight on US makers of guns and opioids, but what happens if the giants team up against an innocent industry? It puts a premium on their judgment. Antitrust scholars worry about collusion — institutions with stakes in different companies in an industry encouraging them not to compete hard with each other (one study found that US airline prices are higher as a result). The evidence is mixed but, as the fund groups expand, their capacity to exert invisible influence over the companies in which they hold stakes strengthens. Like other consumer technologies, index funds have brought great benefits to ordinary investors. But Mr Bogle’s innovation, useful as it remains, may be working a little too well. 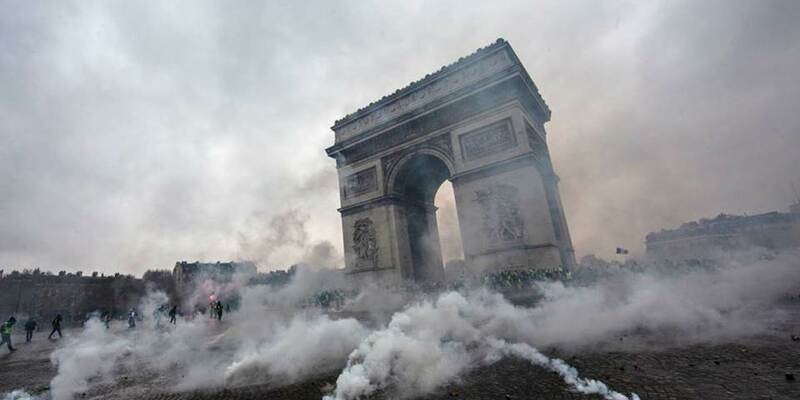 The "Yellow Vest" protests in France over the past month have been compared to the historic revolt of May 1968, when students and workers almost brought the French economy to a halt in the name of political and cultural reform. But unlike its precursor, today's uprising is not so much an exercise in democracy as an attack against it. STRASBOURG – The spontaneous street protests in Paris over the past month come almost exactly 50 years after the mass revolt of May 1968. But that is not to say the two events are comparable. Les événements de mai 1968 was an anarchist uprising by students and workers against the traditionalism and apparent authoritarianism of President Charles de Gaulle. Today’s “Yellow Vests,” by contrast, have eschewed intellectual and political debate, and quickly degenerated into a rioting mob. Worse still, the extremist activism has already spread to neighboring Belgium and the Netherlands, which now have Yellow Vest movements of their own. And in Italy, Matteo Salvini, the xenophobic interior minister, has capitalized on the riots to launch a broadside against Macron’s policies. Never mind that Italy is in even more desperate need of a Macron-style reform agenda than France. The fact that alt-right agitators are using the Yellow Vest movement as a platform to spew hate and lies should worry all Europeans. In one way or another, many of today’s populist parties and movements draw financial support from the Kremlin. There is a growing body of evidence to suggest that the United Kingdom’s 2016 Brexit referendum was influenced by “dark money” from Russia. And Russian trolls have continued to foment Islamophobic hatred across Western Europe. A countermovement against such disinformation is long past due. The first step in stemming the populist, Euroskeptic tide is to tell the truth and point out the lies. But let us not be naive. Countering the alt-right threat to our societies will also require deep reform. A common populist criticism of the EU is that it functions opaquely and often incomprehensibly. Yet, if anything, the EU tends to be rather weak in the face of global challenges. Contrary to populists’ claims of overreach, European institutions almost always do “too little, too late.” That must change, and radically so. We need to make the EU far more democratic, transparent, and effective – which is to say, more sovereign – than it is today. This does not require us to reinvent the wheel. We need only return to the ideas of Europe’s founding fathers: Jean Monnet, Paul-Henri Spaak, Robert Schuman, Alcide de Gasperi, and others. These leaders had a clear vision of a simpler yet stronger Union, led not by a 28-member commission, but by a real government with 12 ministers. They would have allowed Europeans to vote directly for a parliament with full competencies and legislative authority, and without the system of unanimity that has allowed rogue member states such as Hungary to tie the entire bloc’s hands. Above all, we must not equate liberal democracy with the status quo, which all but ensures slow, arduous decision-making. If the EU suddenly were to make collective decisions by simple majority, the problems confronting it would no longer seem intractable. Europe would finally be able to stand on its own and address its citizens’ concerns. Of course, controlling our borders does not mean closing ourselves off from the outside world. Europe will always need to engage with other powers. But it must do so from a position of strength. If the EU can rediscover its democratic potential, the alt-right will no longer have grounds on which to launch attacks against international cooperation and multilateralism. In a more democratic Europe, citizens who took to the streets would do so not to scapegoat migrants and journalists, but to demand solutions for the real challenges we face. Before it was co-opted, the yellow vest movement was based on a genuine concern about economic security. The lesson for all EU member states is that we must shore up our national social-security systems, while moving forward on EU-level reforms. With a full-fledged banking union, citizens’ savings would be secured, and taxpayers would not end up on the hook for private-sector profligacy. And with a complete monetary union and an autonomous joint budget, the eurozone would be far more resilient in the event of another financial crisis. Until Europe gets serious about economic reforms, our economy will continue to underperform structurally vis-à-vis the rest of the world. Since 2010, the average annual growth rate in the euro area has been 1.3%, compared to 2.3% in the United States. This gap represents €1.2 trillion ($1.4 trillion) from 2010-2018, or approximately €500 billion lost in terms of tax revenue. For France alone, this amounts to €10 billion every year – the budgetary cost of what Macron recently proposed to meet the Yellow Vests’ original demands. The uprising that Europe needs will not happen in the streets of Paris or Brussels, but within the EU’s paralyzed institutions. For more than five decades, power within Europe has been divided between conservatives and socialists who, collectively, have failed to address the challenges of the day. It is time to leave the European talking shop behind us. The current era demands action. In the May 2019 European Parliament election, “Generation Europe” can break the old political order and take the revolution out of the streets and into the hallways of European democracy. Guy Verhofstadt, a former Belgian prime minister, is President of the Alliance of Liberals and Democrats for Europe Group (ALDE) in the European Parliament and the author of Europe’s Last Chance: Why the European States Must Form a More Perfect Union. Last month, the U.S. Senate passed a resolution that could limit U.S. military involvement in the war in Yemen. There’s been intensifying criticism of the humanitarian impact of the war and pressure on the Saudi-led coalition to end the fighting there. But many also see the Senate resolution as a response to Saudi Arabia’s involvement in the killing of Jamal Khashoggi in the Saudi consulate in Istanbul. The anger over his death and the brutal way in which he was killed has placed increasing pressure on governments and political leaders in many countries to take action against the Saudi regime. This puts Washington in a tough spot. Given that the U.S. is already overstretched militarily, it increasingly needs to rely on allies like Saudi Arabia to secure its interests in the Middle East. So any attempts to limit U.S. cooperation with Saudi Arabia and its efforts in Yemen has the potential to hamper relations with a key partner and might actually block the U.S. from pursuing its objectives in the region. This raises a critical geopolitical question: To what degree can state institutions inhibit a country’s ability to pursue its imperatives in the short term? This Deep Dive will seek to answer this question as it relates to U.S. involvement in the war in Yemen. In the U.S, the killing of Jamal Khashoggi in early October drew fresh scrutiny of the Saudi kingdom as well as the coalition it leads against Houthi insurgents in Yemen. Some politicians felt the need to respond to the public shock and indignation over Khashoggi’s death by limiting the Trump administration’s ability to collaborate with Riyadh. The result was the resolution that passed in the Senate 63-37 and could eventually force the U.S. to withdraw some of the aid it has provided to the Saudi-led coalition. But U.S. support for the Saudis in Yemen isn’t just about the war in Yemen. The U.S. has long been concerned about a regional hegemon emerging in the Middle East. (On a broader level, one of the United States’ key imperatives is to prevent a regional hegemon from emerging in any part of the world because it could force Washington to redirect resources away from land-based military capabilities toward developing a stronger navy so it can maintain its dominance of the high seas.) The U.S. is concerned that Iran’s expanding influence in places like Iraq and Syria could move it closer to being able to dominate the Middle East. This is a pivotal reason why the U.S. got involved in Yemen – to make sure Iran, which supports the Houthi rebels in their fight against the Saudi-backed government, doesn’t hold extensive influence in yet another Middle Eastern country. But the U.S. has learned over the past 15 years that it can’t win wars alone, and it has to be more selective in choosing the conflicts in which it engages. It must, therefore, rely on regional allies to help achieve its security interests. Restraining Iran, then, requires the U.S. to cooperate with countries like Saudi Arabia and Israel, so it can deploy its own forces only on a limited basis. Yemen is of critical concern for the Saudis; they share a border, and Riyadh can’t afford to let its archrival to gain a foothold there. The Senate resolution, then, seems to aim to limit the United States’ ability to work with one of its key partners. But on closer examination, the resolution isn’t nearly as significant a constraint as it first appears. At most, it would curtail low-level U.S. support of Saudi actions against the Houthis in Yemen. And that’s assuming the resolution moves past the next stages. The vote in November was only on whether the resolution should be sent for further debate and then to a second and third vote in the Senate. Even if it passes the final hurdle there, the White House has said the president would veto it. (Though there’s a similar bill in the House of Representatives that couldn’t be vetoed by the president.) By voting for the resolution, then, senators were able to show concern over the issue without actually forcing any change in policy. Moreover, the resolution isn’t exactly clear on what forces or assets the U.S. would need to withdraw. It states, “Congress hereby directs the President to remove United States Armed Forces from hostilities in or affecting the Republic of Yemen, except United States Armed Forces engaged in operations directed at al Qaeda or associated forces … .” In other words, U.S. forces engaged with al-Qaida or associated entities wouldn’t need to be pulled out of Yemen. So the U.S. could maintain some limited engagement and still be compliant with the resolution. A key question, however, is why domestic institutions would want to constrain U.S. actions abroad in the first place. This is where national identity and domestic politics play a critical role in geopolitics. National identity helps shape citizens’ perception of right and wrong, which in turn can influence leaders’ actions and the policies they promote – or at least the ones they promote in public. Sometimes, this means a country’s actions abroad are genuinely intended to protect the values its citizens deem important. Other times, politicians just try to convince the public that the country’s allies act in a way that is consistent with its own values, even if they don’t, so that public discourse doesn’t interfere with a country’s pursuit of its national interests. Franklin Roosevelt, for example, famously referred to Josef Stalin as “Uncle Joe” when it was essential that the two countries join forces to defeat Nazi Germany, despite the brutality with which Stalin seized and held on to power. But when an ally openly commits an act that violates a country’s values, leaders may be forced to respond in a way that at least appears to punish that ally to appease the public. Often, the outrage will pass, the issue will be replaced by some other topic that occupies the media’s attention, and leaders will revert back to their prior course. But if that act remains in the spotlight for a longer period of time, as was the case with the Vietnam War, then it can create longer-term constraints on a state’s actions abroad. In some cases, the public isn’t driven only by a desire to defend their values but also by their own self-interest, which is an even more powerful motivator for change. During the Vietnam war, for example, the majority of Americans opposed the war not just because they thought it was unjust but also because the draft may have forced them to risk their own lives in the conflict. A country’s pursuit of its interests, then, can be more limited when citizens are directly affected by the policies required to pursue those interests. In the case of Jamal Khashoggi, the public indignation at Saudi Arabia is solely values-driven, since the American public was not directly affected by the Khashoggi murder. The same goes for the war in Yemen. Aside from a very small contingent of special forces, American lives have not been put at risk to fight this conflict. It’s doubtful, then, that the American public will continue to focus on this issue for long enough to substantially derail the United States’ relationship with Saudi Arabia. It’s also worth noting that this isn’t the first time this resolution has come up for a vote in the Senate. Senators voted 55-44 against the resolution in March. According to many in the media, the Khashoggi killing was the primary reason the Senate had such a change of heart in just eight months. But other Iran-related developments have occurred since March that may have also contributed to the decision. Iran has experienced a number of setbacks domestically – including the reimposition of U.S. sanctions, a plunging currency, nationwide protests against rising consumer prices and continued insurgent attacks in Kurdish and Arab regions – that may weaken its ability to continue waging war in Yemen. Senators may thus see this as an opportunity to pull American involvement there without giving Iran the upper hand. Whether the Senate resolution has any impact on the war in Yemen or on U.S.-Saudi relations depends in large part on how much support the U.S. is providing to the Saudi coalition. And the answer is, not much. The U.S. provided refueling support for coalition aircraft until mid-November, when the White House decided to end aerial refueling for Saudi operations ahead of a House bill that would have restricted U.S. involvement in the war. But the refueling support had little impact on the coalition, since Saudi Arabia and the United Arab Emirates (Riyadh’s main coalition ally) both have air refueling capabilities themselves. U.S. ground support in the war is also extremely limited. In 2017, it was reported that about a dozen Green Berets were stationed on the Saudi side of the Saudi-Yemeni border to locate and destroy ballistic missiles fired by the Houthis into Saudi Arabia. Some have estimated the total number of U.S. military personnel deployed to Saudi Arabia to support the coalition at about 50. These forces are reportedly providing the Saudis with intelligence to help them find targets for airstrikes. But were Riyadh to lose this support, it wouldn’t be a huge setback for the coalition. Thus, the Senate resolution wouldn’t be much of a check on U.S. involvement in Yemen because the U.S. isn’t very involved there anyway. Plus, some areas of U.S. engagement in the country fall outside the scope of the resolution. In late November, Saudi Arabia signed a $15 billion deal with the U.S. for the Terminal High Altitude Area Defense anti-missile system, a more sophisticated system than the U.S.-made Patriot batteries Saudi Arabia currently has. This deal would remain in place even if the Senate resolution forces U.S. special forces to end their support of the coalition. The U.S. also has an ongoing campaign in Yemen against al-Qaida in the Arabian Peninsula, which would not be affected by the Senate resolution. For Saudi Arabia, the U.S. rhetoric against the Saudi coalition in Yemen, as well as the anger over the Khashoggi affair, is tolerable so long as it doesn’t meaningfully affect Saudi Arabia’s interests in Yemen. Riyadh has thus been supporting the Yemeni government in its quest to retake rebel-held parts of the country. This includes Hodeida, a strategic port city on the coast of the Red Sea. The Saudi coalition launched a new offensive there just before peace talks between the Yemeni government and various rebel groups began in Sweden on Dec. 6. Indeed, it’s common for opposing sides in a conflict to launch offensives before negotiations in an effort to gain leverage and strengthen their bargaining positions. So far, the coalition has captured some territory around the city, including areas to its east, a hospital and a large portion of a road that leads to the city. As mentioned previously, one of the main U.S. goals in Yemen is to contain Iran. But even if a resolution manages to limit U.S. involvement there, Washington has other tools, such as sanctions, that aren’t nearly as controversial as engaging in a war that has had such a severe humanitarian cost. It can also lean on its allies in the region to limit Iranian actions. So the resolution really isn’t much of a constraint on the United States’ ability to keep the Iranians in check. But containing Iran in Yemen really comes down to how committed the Iranians are to supporting the Houthis. After failing to show up to peace talks in Geneva in September, the Houthis’ participation in talks in December indicate they may be under greater pressure now than they were just a couple months ago. Still, it doesn’t seem that the war will be ending any time soon. So Iran’s continued invovlement in Yemen will come down to two issues. The first is how much money the war is costing Tehran. While it’s hard to find exact figures on its expenditures in Yemen, estimates hover in the range of hundreds of millions of dollars. (Iran has a total defense budget of $15 billion.) But Iran’s financial resources are stretched to the limit, and it’s already faced resistance throughout this year from average Iranians anger over the plummeting currency and rising consumer prices. The government in Tehran, therefore, may be looking for areas it can cut its costs, and Yemen might be one of them. The second issue is whether Tehran is willing to decrease its support for the Houthis in exchange for sanctions relief. This depends on whether the economic benefits of sanctions relief outweigh the value of tying down Saudi Arabia in Yemen so it can’t threaten Iranian interests elsewhere. For Iran, Yemen is less important strategically than Iraq, Syria and Lebanon, mostly due to its geography – there are logistical challenges in resupplying its forces and proxies in Yemen and it doesn’t offer Iran access to the wider Middle East because it’s isolated on the southern edge of the Arabian Peninsula. Tehran may be willing, therefore, to reduce its engagement in Yemen in return for concessions on sanctions that may be able to release some of the economic pressure it’s facing at home. Saudi Arabia knows that whatever happens in the U.S. Senate, Washington and Riyadh are working toward the same goal: eliminating the Iranian presence from Saudi Arabia’s southern border. The Senate resolution, therefore, won’t have a major impact on U.S.-Saudi relations. Both countries are still on the same page strategically, and the resolution is mostly about politicians needing to appear sensitive to their constituents’ concerns, but it won’t place any meaningful limits on the United States’ pursuit of its interests in the Middle East. - Art Cashin mentioned a metaphor in 2017 that could apply now: he said that market players had only the protection provided by pictures of lifeboats, not the actual lifeboats themselves. - That is the current market situation in a nutshell; I would argue that the current market risk is far greater than perceived by many. 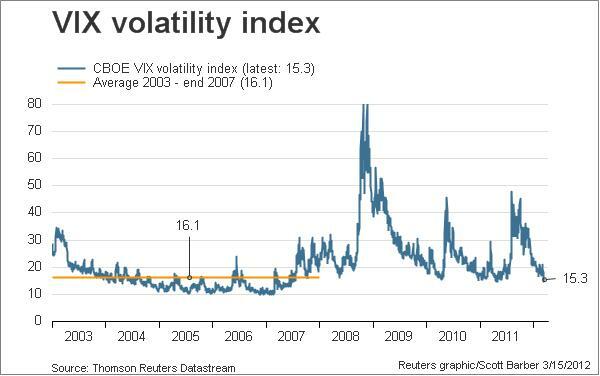 - The volatility we're seeing on some measures has not been seen since 1936, right before a 50% drop. 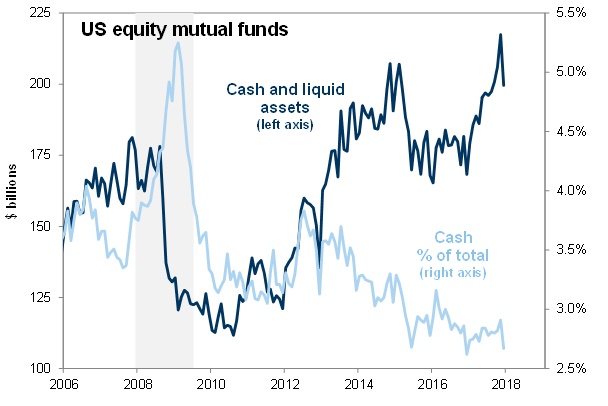 - Household equity exposures are still high and equity mutual fund cash positions are at record lows, margin debt is unprecedented, and liquidity is low; all of this indicates extreme downside risk. - Prudent investors may want to hold lots of cash, plus GLD or IAU, OTCRX, WHOSX, and TLT. Famous market observer Art Cashin mentioned a metaphor in October 2017 that resonated with me. He said (words to the effect that) at that moment, market players had only the protection provided by pictures of lifeboats, not the lifeboats themselves. 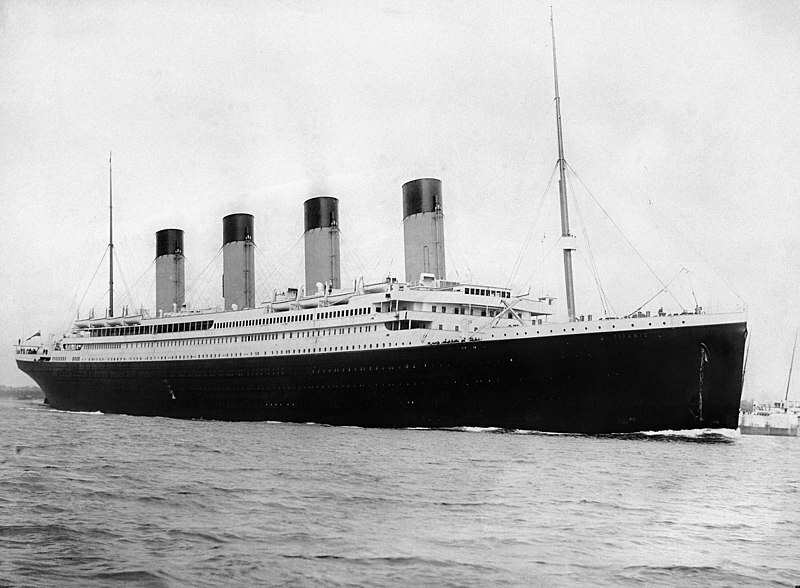 This is just like the Titanic (pictured above), whose measly 16 lifeboats looked nice, but left many hundreds on board with no means of escape when the ship sank. That is the current market situation in a nutshell. Players seem to believe that their positions are diversified enough to protect them in a downturn, and in any case, many appear to expect no major drawdown in spite of many months of extreme volatility. I would argue that the risk is far greater than perceived by many, and the protections most have in place are quite inadequate. There are a number of lines of evidence to support this interpretation. For example, sentiment is still decidedly bullish, with the latest Investors Intelligence survey indicating 45% of investors are bullish and only 20% are bearish (David Rosenberg, 2018). This is in spite of investors seeing three sessions this year in which the S&P 500 (SPY) suffered 3% drawdowns against not one with a 3% gain; this condition last occurred in 1936, right before a 50% drop in 1937 (David Rosenberg, 2018; Op. cit.). For the Dow Industrials (DIA), there have been four days of 3% declines this year, with again no advances that big; this condition last occurred in 1897. David Rosenberg also points out that households still have an extremely high exposure to equities, based on historical records going back to 1965. 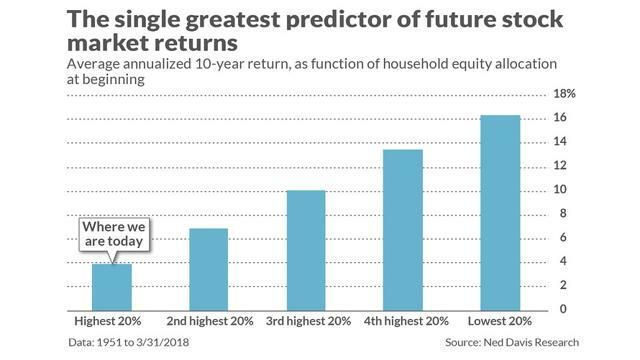 Data suggest that this level of exposure to equities serves as a prediction that future returns over the next decade will be below 4% annually (Chart 1: cf. Mark Hulbert, 2018). Also receiving scrutiny is the fact that the liquid asset ratio at domestic equity funds is at an all-time low of only 2.6%, well below the level seen right before the panic selling in 2008 (Chart 2). 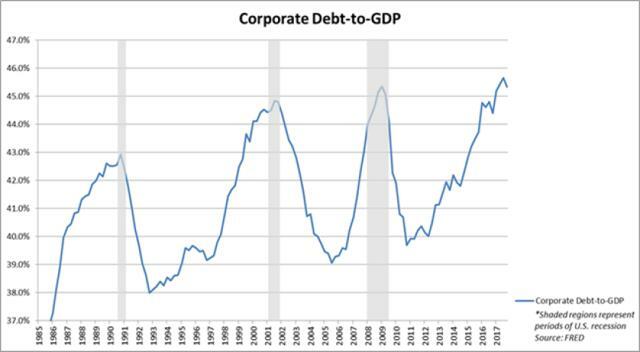 Corporate debt issuance as a percentage of GDP is at a 32-year high and has diverged very startlingly from the high yield default rate (Chart 3). 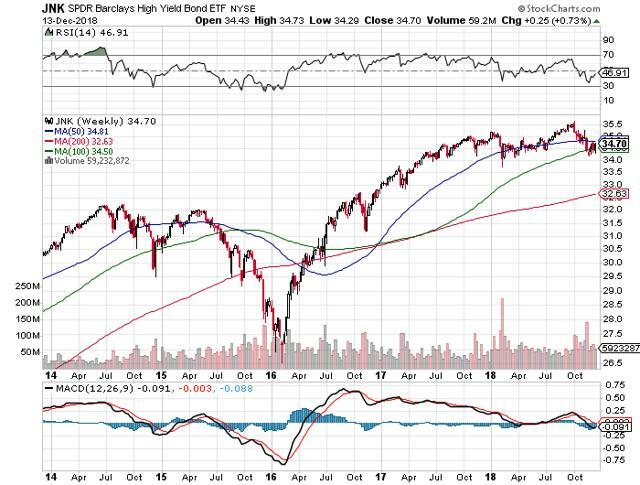 These kinds of things mean revert, and we have already seen spreads widen significantly since September, thus a major sell-off in illiquid high yield bonds is on the way. Markets have only discounted junk bond funds like the SPDR Barclays High Yield Bond Fund (JNK) by 2.65% so far (Chart 4), but the downside is more in the range from -25% (2016 low) to -41% (2008 low). 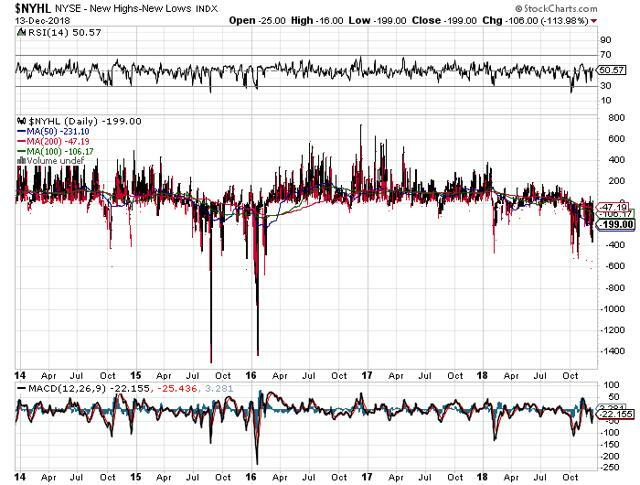 It is also somewhat alarming that the VIX (fear) index has only jumped from a low of 11.5 to a recent high of 24, far below the typical highs of 40 seen in cyclical corrections and the extreme high of 80 seen in 2008 (Chart 5). 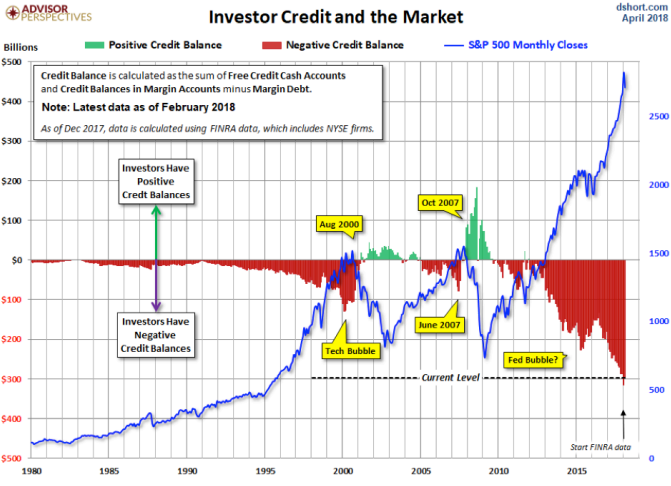 Margin debt is also at the highest levels ever observed (Chart 6), and according to Brad Lamensdorf (quoted by Shawn Langlois, 2018), this represents a huge additional risk to the markets in the event of a significant sell-off. Also of some concern is the fact that the NYSE measure of market breadth (New Highs minus New Lows Index, or NYHL) has only dropped to about -600 so far, a far cry from the -1,400 seen in 2016 (Chart 7). 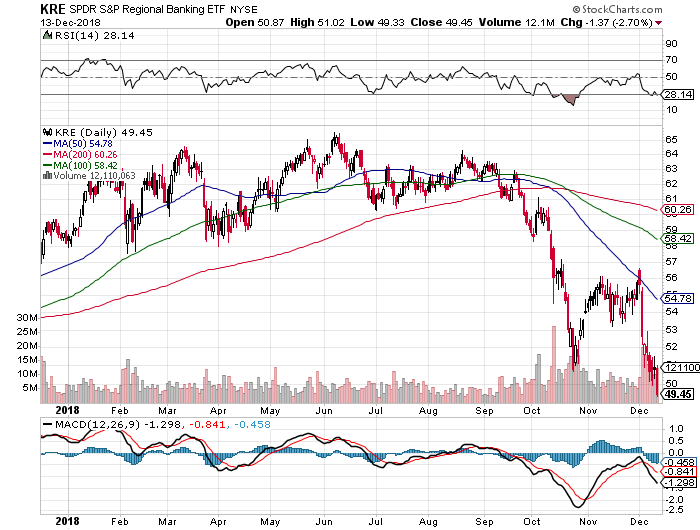 As an additional sign that all is not what it should be, notice that since September 20th, Regional Banks (KRE) are off a whopping 24% in a rising rate environment that was supposed to support better profit margins for the financial sector (Chart 8). And if we examine the ratio of the KRE index to the UST 3-month bill, we see an absolutely stupendous collapse since 2015 (Chart 9), and this ratio is still falling. The observed degree of decline for this ratio is a bit counterintuitive, and I would suggest that something is clearly wrong. Markets are not really discounting the implications of this. 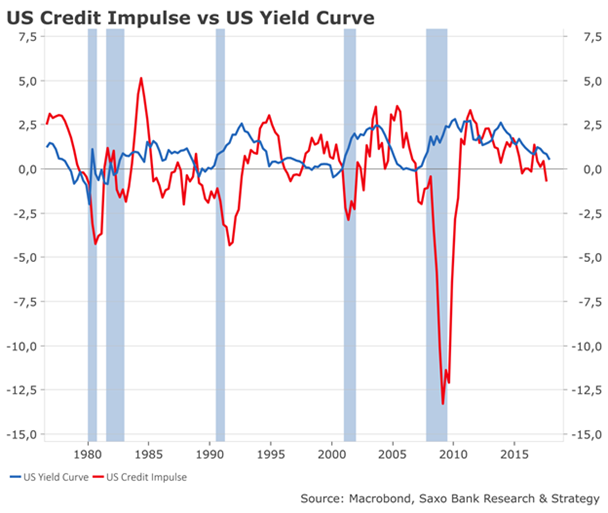 Indeed, the end of the credit cycle appears to be upon us, with the credit impulse (rate of change in credit) falling into negative territory (Chart 10) and corporate debt/GDP at a peak level seen only in association with the end of the cycle (Chart 11). It would appear that recession cannot be very far behind, as JPMorgan Chase & Co. analysts have pointed out recently, according to David Rosenberg (2018; Op. cit. 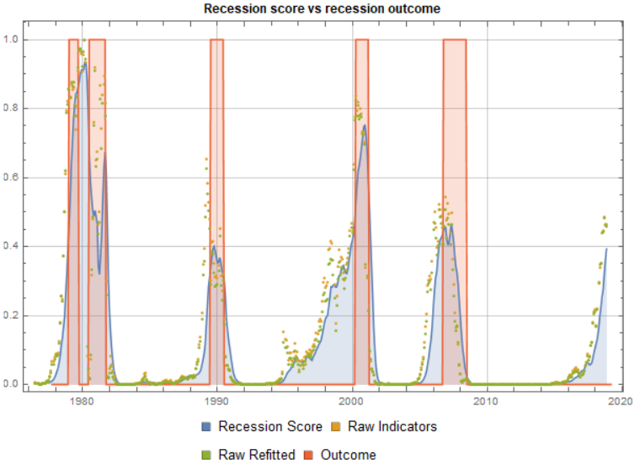 ), and others have independently calculated (Chart 12). Given all of the indicators and risks mentioned above, it would seem prudent to adopt a defensive portfolio posture, or even (for those who are very conservative investors) to go into the proverbial fetal position. 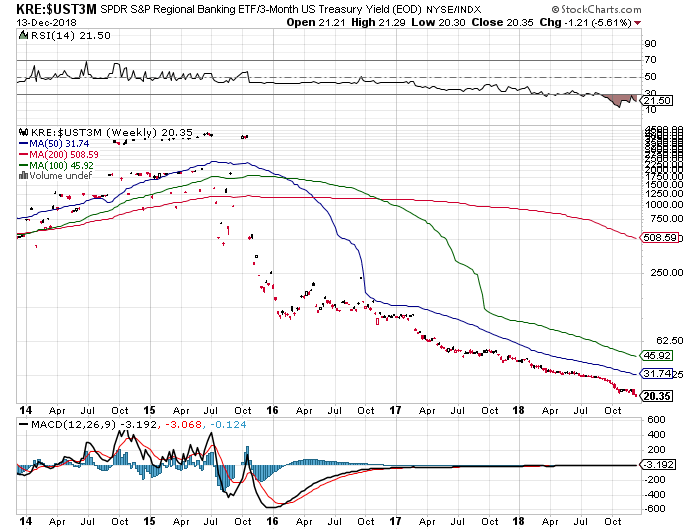 In the end, I believe that those who own long-term Treasuries and gold will make a lot of money in the next 12-36 months, and those holding stocks will writhe in pain at their enormous paper losses. Allowing for human nature, most people will sell closer to the bottom than the top. 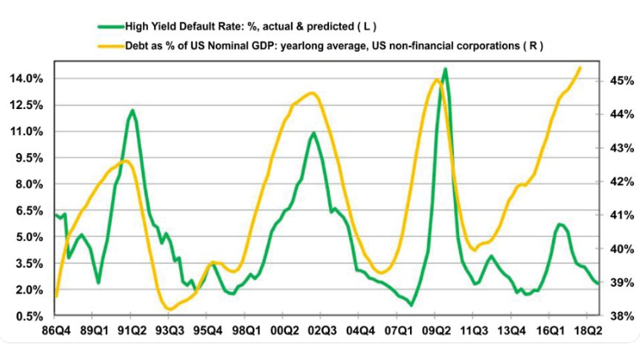 A bull market for the US Treasury bond is historically the norm under these circumstances (Eric Hickman, 2018), and a strong one is likely again (Van Hoisington & Lacy Hunt, 2018). Given the current long-term sell-off from the January market high, the renewed sell-off from the October market high, and the state of certain national economies (e.g., China, Europe, Japan), it makes sense to invest some money in a gold fund like SPDR Gold Shares Trust (GLD), but only as a short-term hedging trade, not a buy-and-hold position. The iShares Gold Trust (IAU) is an alternative ETF that may be safer for those who want to hold it for a somewhat longer period of time. But the safest form of gold in the event of a true financial apocalypse is physical gold. Also, for those discounting a possible near-term recession and bear market, some liquid alternatives like the Otter Creek Prof. Mngd. Long/Short Portfolio (OTCRX) could be held to protect assets in the event of a much sharper market drawdown associated with deteriorating economic data. Those in a more defensive frame of mind because of the expected eventual market slide should also hold some long Treasuries, in spite of bearish arguments to the contrary, as a stock market crash would be hugely supportive of bond prices: examples include the Wasatch-Hoisington Treasury Fund (WHOSX), and the iShares 20+ Yr. Treasury Bond ETF (TLT).